Welcome to Crafty Fox Cottage, brought to you exclusively by Character Cottages, local specialists in stylish Cotswold holiday rentals. THIS PROPERTY IS INSTANTLY BOOKABLE, WITH THE EXCEPTION OF BOOKINGS COMMENCING WITHIN 7 DAYS OF THE BOOKING DATE. FOR AN ARRIVAL WITHIN 7 DAYS, CONFIRMATION FROM THE PROPERTY OWNER IS REQUIRED BEFORE IT CAN BE ACCEPTED. Please click More Details to read about the House Rules. 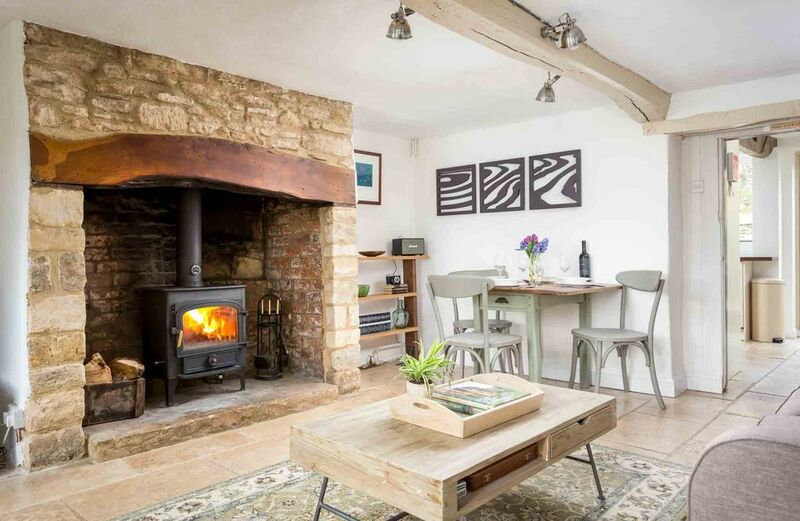 Crafty Fox Cottage is a stylish, Cotswold stone cottage, located on a peaceful country lane in the hamlet of Foxcote, surrounded by beautiful rolling countryside. There are many scenic walks easily accessible from the cottage, including the well known Gloucestershire Way, and a traditional local pub is within walking distance. The nearby village of Andoversford contains another lovely pub, as well as a village store and a Post Office. Despite the cottage's stunning rural location, it is only five miles away from Cheltenham, with its wide range of shopping and dining options, and lively calendar of events, including the famous horse racing festival every March. The famous market town of Bourton-on-the-Water, often referred to as the "Venice of the Cotswolds" is also only 9 miles away, and the many charming villages and towns of the Cotswolds can be easily explored from Crafty Fox Cottage. Recently refurbished by its owners to a high standard, the cottage combines a lovely, contemporary style with character features, which include exposed beams in many rooms, tiled floors, and a large inglenook fireplace with wood burning stove. The traditional character of the cottage has been complemented by modern facilities, including wireless internet access, a Freeview TV, and an electric Aga in the spacious, well presented kitchen. Crafty Fox Cottage sleeps four people, in two bedrooms, with one bathroom. There is a well-established garden at the rear of the cottage, which backs onto open countryside. The cottage is perfect for a family, or friends, seeking an idyllic rural retreat in the heart of the Cotswold countryside, whilst still being close to the beautiful spa town of Cheltenham. The property has free wireless internet access, a Freeview TV with DVD player, and a Bluetooth speaker. Young children should be supervised at all times in the garden, as there is a drop between the lawn and the patio area. This is an old property with character features, including steep stairs and low doorways, which is laid out over two floors, and could therefore pose difficulty to guests with limited mobility, or carrying babies, both in terms of their general movement and their ability to exit the house quickly in the event of an emergency. If you would like to read more about the property’s features, then feel free to get in touch by searching the web for Foxcote Cottage Character Cottages! Thank you for your lovely review, Denise. We're pleased to hear that you enjoyed your break in the Cotswolds. We hope that you visit again soon! A great home away from home. A lot of extra's that make the house luxury. The toaster, radio, a good bed, breakfast for the first days, washer etc. We recommend this place and will surely book it again if ever in the Cotswolds. Thank you for your lovely review for Foxcote Cottage. We're pleased to hear that you had a wonderful stay and we hope that you visit again soon! We stayed for a week (family of four, kids are 6 & 3yrs old) & the house has absolutely everything we needed for a home from home stay. Loads of stuff to do in the area with the kids too. Ildi is a fantastic host. Thank you for your delightful review, Helen. We're pleased to hear that you had a lovely stay and got to enjoy all the local attractions. We hope that you visit again soon! Cottage excellently equipped to very high standard. Beautiful location. Quiet. Very attractive garden. Good base for exploring the area. Thank you for your delightful review of Foxcote Cottage, Carol. We're pleased to hear that you had a lovely stay in the Cotswolds, and we hope you return soon! Car: Foxcote is easily accessed by car, being less than a mile away from the A436 and two miles away from the A40, two of the major roads through the centre of the Cotswolds. Foxcote is approximately five miles south-east of Cheltenham and 10 miles west of Bourton-on-the-Water. Train: The nearest railway station to Foxcote is Cheltenham Spa (approximately seven miles away), which has regular, direct services to London Paddington, with a typical journey time of approximately two hours. Plane: Foxcote is within easy reach of a number of international airports: Heathrow International Airport: 77 miles, approximately 75 minute drive; Birmingham International Airport: 67 miles, approximately 70 minute drive.